Americans are adding more spicy (hot) foods to their diet. Sriracha chili sauce has been available for decades. Recently, several fast food and sit-down restaurants have offered sriracha flavored spreads and dips. Grocers offer sriracha flavored mayonnaise next to regular sriracha chili sauce. Sriracha mayo made from full-fat mayonnaise has 90 to 100 calories per tablespoon. When served as a dip, it doesn’t take long to eat 2, 4, or more tablespoons. That’s a lot of calories. Sriracha Dip, Dressing & Spread is based on my recipes for 25 calories or less Ranch, Thousand Island, and Spicy Mustard dips, spreads and salad dressing. By using reduced fat mayonnaise and low or zero fat yogurt, you can cut calories by up to 75% compared to full-fat salad dressings and dips. A one-quarter cup serving has about the same number of calories as full-fat prepared versions. Plus, you can control the heat intensity by adjusting the amount of sriracha sauce. Adding yogurt not only cuts calories, it adds protein not available from mayonnaise only based dips and dressings. You can easily thin this recipe to any desired consistency using water and/or milk. Using milk adds a few calories and protein. 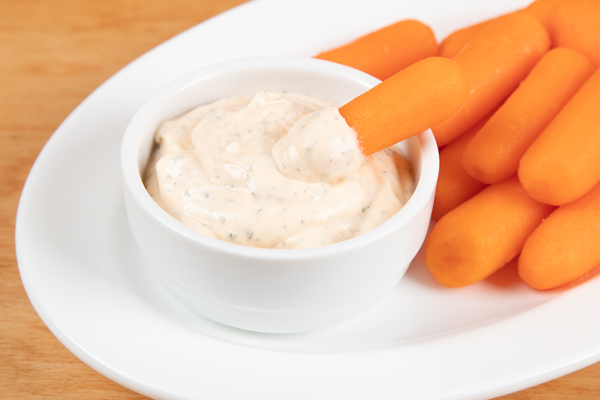 Combining mayonnaise, yogurt and Sriracha produces a thick dip or spread especially when using Greek yogurt. It’s perfect for sandwiches, but too thick for dips and salad dressing. Water, milk or a combination of the two can be used to thin the recipe. Begin by stirring in 1 to 2 tablespoons of water and milk and than continue adding a teaspoon or tablespoons at a time until the mixture has the desired texture. You may have to add more Sriracha to bring the heat level back up. Adding a little vinegar adds tartness. Only add vinegar when thinning with water or without thinning. Do not using when thinning with milk since vinegar sours milk. When tinned for salad dressing, use within 2 days. Otherwise, the dressing can become watery. You can thicken the dressing by adding mayonnaise or yogurt. Add one or more teaspoons, or to taste, of sriracha chili sauce to Ranch dressing to add heat and enhance the flavor. You can also use sriracha for homemade Thousand Island Dip/Dressing. In a small bowl, stir all ingredients until well combined. Thin, if desired, by adding water and/or milk. Use immediately or refrigerate overnight to enhance the flavor. Use within 4 days.